Hello everybody! How are you? Do you have any snow where you live? We got a lot over the weekend so I am more than happy to share some. Where was all this snow at Christmas when we actually wanted it?! Valentine's day is just around the corner so I am curious how you celebrate it. Me and my other half usually don't to be honest. We like to give each other small surprises all year long at random days, so we have many "fake Valentine's days" through the year instead of just one in February. Earlier this year I was asked if I wanted to be a guest designer for The Paper Nest Dolls. I was really honoured and of course I said yes. :D I got to play with this adorable digi stamp that is perfect for Valentine's day cards, as well as for other occasions. I coloured the image with Faber Castell pencils - nothing fancy, just regular school pencils. For my card I used some beautiful papers from MME. These papers are really great, because they come with some sentiments and words that you can cut out and use them on your projects - like I did on my card. I embellished the card with some lace and pearls from my stash. Lovely card, great bold ,colours. 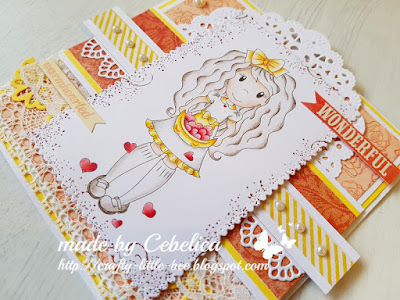 Wonderful card with great colour and paper combos. 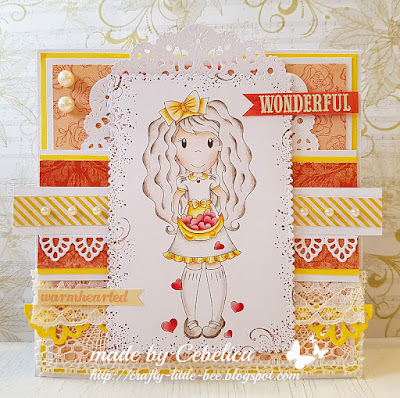 Thanks for joining us at CHNS Patterned Paper Challenge this month.